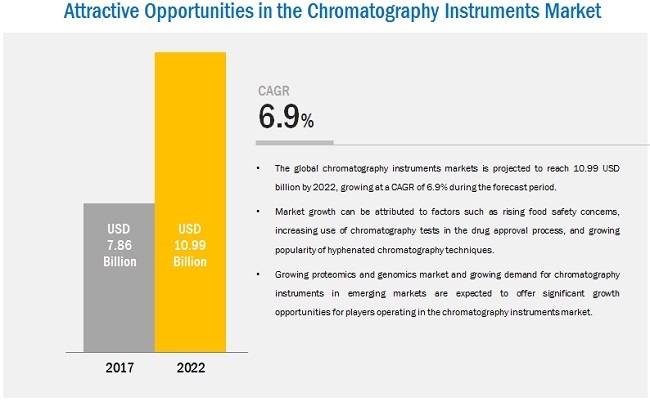 [245 Pages Report] The global chromatography instruments market is projected to be valued at USD 7.86 billion in 2017 and is expected to grow at a CAGR of 6.9% to reach to USD 10.99 billion by 2022. Rising food safety concerns, increasing use of chromatography tests in the drug approval process, and growing popularity of hyphenated chromatography techniques are some of the factors driving the growth of this market. Considering the potential applications of LC-MS and GC-MS and the growing demand for hyphenated techniques, major companies are focusing on launching LC-MS and GC-MS instruments in the market. For instance, in March 2017, Agilent Technologies, Inc. (U.S.) launched the 6495B Triple Quadrupole LC-MS system which offers greater accuracy and high sensitivity for various applications in forensic toxicology, peptide quantitation, environmental testing, clinical research, and food safety. Chromatography is one of the most commonly used analytical techniques in the testing and quality control of food products. Food contamination a major global concern, with more than 200 types of diseases caused by the consumption of unsafe food every year (Source: WHO). As estimated by the CDC, diarrheal diseases caused by contaminated food and water kill 2,195 children per day. In the U.S., 48 million people (1 in every 6 Americans) fall sick from the consumption of contaminated food every year. The market comprises a network of players involved in the research and product development; raw material supply; component manufacturing; distribution and sale; and post-sales services. Major players in the market include Agilent Technologies, Inc. (U.S.), Waters Corporation (U.S.), Shimadzu Corporation (Japan), Thermo Fisher Scientific Inc. (U.S.), and PerkinElmer Inc. (U.S.). 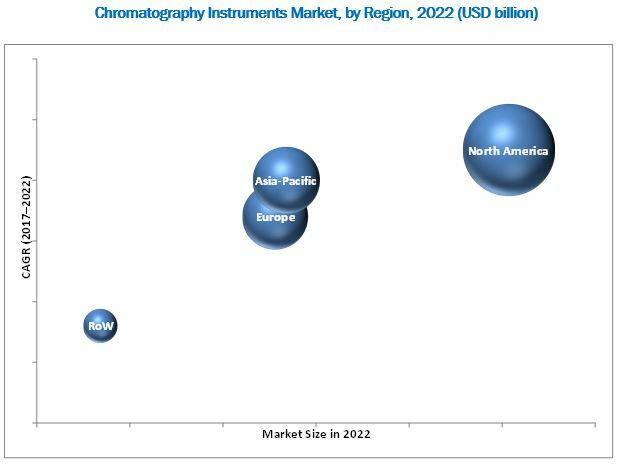 The global chromatography instruments market is expected to reach USD 10.99 billion by 2022 from USD 7.86 billion in 2017, at a CAGR of 6.9%. The rising food safety concerns, increasing use of chromatography tests in the drug approval process, and growing popularity of hyphenated chromatography techniques are the key factors driving the growth of this market. Chromatography is an analytical technique commonly used for separating a mixture of chemical substances into its individual components, so that the individual components can be thoroughly analyzed. It is a nondestructive technique where the separation is based on differential partitioning between the mobile and stationary phase. The mobile phase transports the solution or sample mixture through the stationary phase, which then separates different components of the solution. Chromatography is an essential technique used in the biopharmaceutical industry, life science research, food and beverage industry, and environmental agencies. The market has been segmented, on the basis of type, into systems, detectors, auto-samplers, and fraction collectors. The systems segment is projected to register the highest CAGR during the forecast period. The growth of this segment can primarily be attributed to its increased use in drug approval process, technological advancements and the increased capability of the systems to analyze complex compounds. The market in North America is expected to grow at the fastest CAGR during the forecast period. Increasing funding for R&D activities in healthcare industries, growing funding for environmental testing and clean-up in the U.S., government initiatives to improve laboratory infrastructure, and government investments for environmental protection in Canada are one of the major factors driving the growth of the market in this region. Chromatography is used to quantify the amount of chemicals in drugs and for the analysis of various solvents used in the manufacturing of pharmaceutical products. Owing to the high resolving power and high sensitivity of chromatography instruments, they are widely used for amino acid analysis. 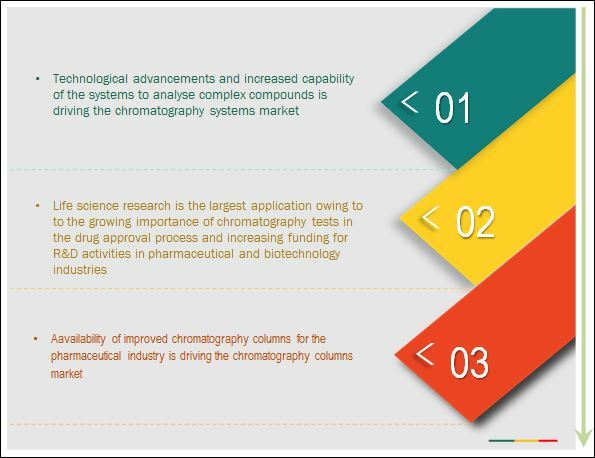 In addition, technological advancements in chromatography instruments have increased their speed, accuracy, and resolution. These developments have enabled pharmaceutical companies to improve their productivity and efficiency. Identifying environmental contaminants is challenging because a large variety of compounds are found in the environment, which vary in their chemical composition. Based on their composition, chromatography techniques help detect these trace organic compounds in environmental samples. Chromatography instruments are extensively used for the quantification of volatile organic compounds in food products. They are mainly used for quality control and testing additives, contaminants, toxins, and residues. Mass spectrometry (MS) combined with gas chromatography (GC) is the most common technique used for elemental analysis in food testing. It is also used for the analysis of agricultural chemicals, such as pesticides, fertilizers, fungicides, and their metabolites. What are the upcoming industry applications for chromatography instruments? The high cost of chromatography instruments is a major factor restraining the growth of the market. Chromatography instruments used in the pharmaceutical industry are expensive as they use capillary columns to separate compounds like oxygen, hydrogen, and methane. Companies in the biotech & pharmaceutical industry, food & beverage industry, and environmental agencies require many such systems; this significantly increases the capital cost spent on these systems. In addition, the maintenance costs and other indirect expenses result in an overall increase in the total cost of ownership of these instruments. Academic research laboratories find it difficult to afford such expensive systems as they have controlled budgets. 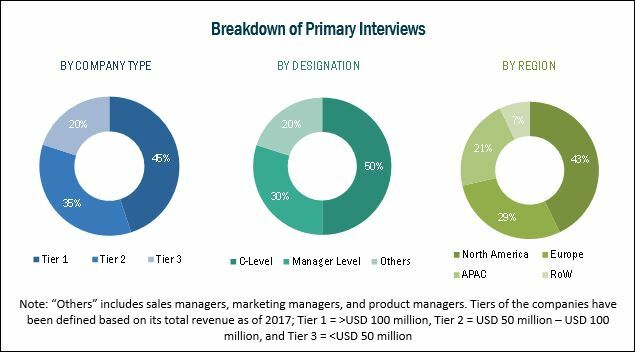 Key players in this market include Agilent Technologies, Inc. (U.S.), Waters Corporation (U.S.), Thermo Fisher Scientific Inc. (U.S.), Shimadzu Corporation (Japan), PerkinElmer, Inc. (U.S.), Danaher Corporation (U.S.), Merck KGaA (Germany), Bio-Rad Laboratories (U.S.), Restek Corporation (U.S.), Gilson, Inc. (U.S.), JASCO, Inc. (U.S.), and SCION Instruments (U.S.). These players are increasingly undertaking mergers and acquisitions, and product launches to develop and introduce new technologies and products in the market.